I'm sure the last time I wrote anything to do with Buzzy's Audio-Animatronic self, it was in response to a legend - yes, the times when *cough* he'd end up in condition 101 (as you may recall in article titled "Epic Brain Fart (or stroke of bad luck)?" and includes an anecdote from a past CM at the time, credit mentioned). Of course, because this is Possibilities, it's important to note that the technology for Audio-Animatronics have actually taken a leap forward, since the Enchanted Tiki Room in Disneyland, 1963, and especially through the golden eras of the Magic Kingdom and EPCOT Center throughout the respective 1970s and 1980s onwards. A Wikipedia article exists if anyone is interested in learning a little about the well-known technology in park presentations today. Related information is found over at their Autonomatronics tag on the Disney Parks' official blog. Demonstrations aside, near the end of that same year, Mr. Lincolin of the Hall of Presidents was the first to forgo hydraulic technology in favor of a more electronic-based framework model, as mentioned in the Theme Park Insider news article for reference. Furthermore, another take on vast improvements on audio-animatronic figures involves even the tweaking of how they construct and test the figures to achieve a sense of realism (allowing for better portrayal of facial expressions), but judging by the test videos, it feels a little like the uncanny valley, revisited but conquered yet again. The diagram, bearing some sketches, and in English. 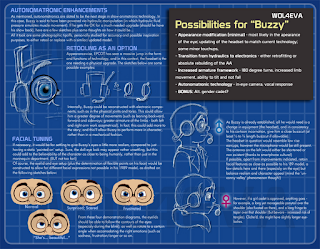 Also, there are those who probably approve of a female pilot as a 'secondary' main character behind the neural controls, 'she' could be in the same way (note identification differences in the sketches noted as an example only) as Buzzy might be constructed to the latest, but if theater technical specifications serve correct, it is currently hard to devise a system to automate a 'pilot rotate' if gender separate shows are needed. For some reason, to have both characters work together as a team might be a possible idea, but logistical and engineering conflicts might remain if the theater was retrofitted in this way. So this means that if a duet system were to be possible, either the theater would have to be gutted and given a reconstruct (if it ever happens), or we seriously need a better location. 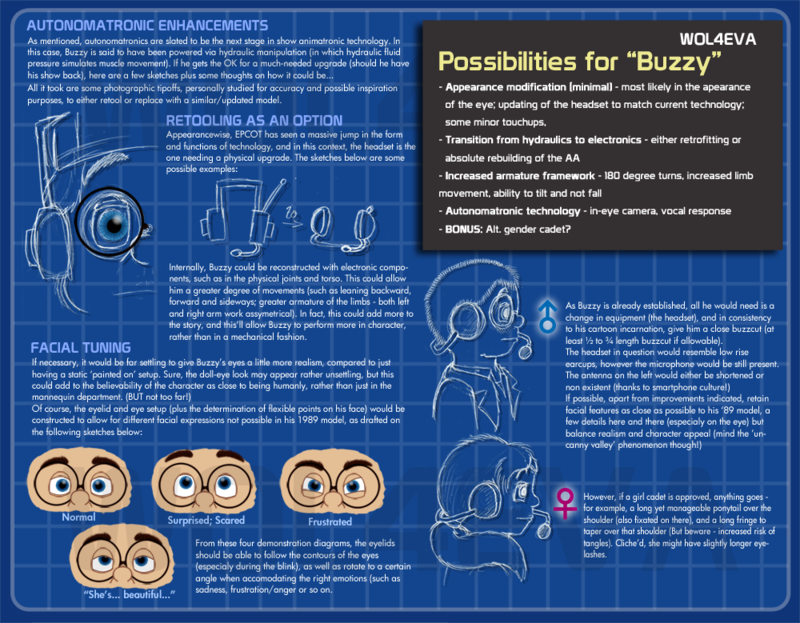 Anywho, my two cents on how Buzzy would have gotten a second chance at life. If you have any thoughts or just anything else pertaining to Buzzy being retrofitted, feel free to leave a comment. Footsteps - Gulf Coast Exploreum's "My Bodyworks"